Description: -This palm looks like a large Vietchia palm, with very neat heavily arching fronds makes this an excellent avenue plant or landscaping palm. 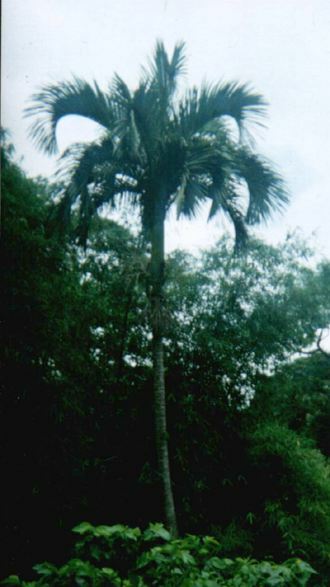 This palm grows very well in the subtropics and grows in the same habitat as Veitchia arecina, the main population of this species can be found on the island of Erromango where in numbers in the hundreds. This species needs little attention once established and seems to be quite drought tolerant, and it can be grown in the full sun or shade and would make a fantastic landscaping statement just on it’s own, it seems to handle the cold very well and could possibly be grown as far south as Sydney. A stunning palm for any garden it likes a well mulched garden bed and should be planted in a prominent area to appreciate the true beauty of this palm, this species grows much faster in the tropics than it does in habitat..! it also seems to respond to plenty of water if you would like to make this species grow faster and fertilizer once a year in the warmer months for the best groth.Temps down to 3.C up to 40.C. Growing Climate: - Temps down to 3.C up to 40.C. Likes rich soils and good feeding in the warmer months.